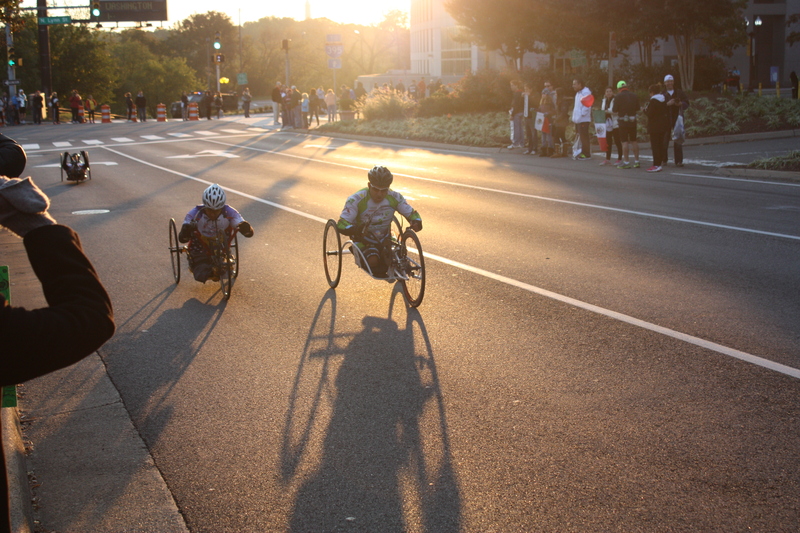 I set out this year with a BQ or bust racing mentality that all centered around one race – the Marine Corps Marathon. After coming just more than two minutes shy in my last attempt, I wanted to get there more than ever. The bombings at this year’s Boston Marathon only intensified that desire. I didn’t get that goal on Sunday though. I wasn’t even close, instead running one of my slowest marathons in years. Was it a bust though? I battled through one of the toughest training cycles I’ve had to date where I was sick multiple times and dealt with constant tight and sore calf muscles that landed me in physical therapy for the last two weeks of training. Still, I made it to the starting line on race day. Despite running through pain from very early on in the race, I crossed the finish line of my 10th marathon. No, I definitely can’t call that a bust. I’m really proud of that accomplishment. I’d be lying though if I said I wasn’t a bit disappointed and sad that I didn’t reach my goal. I’ll have more to come on what I think went wrong and where I’ll go from here, but for today’s post, I’ll stick to the race day recap. After a good night’s sleep I popped up when my 5 a.m. alarm went off and started getting ready. 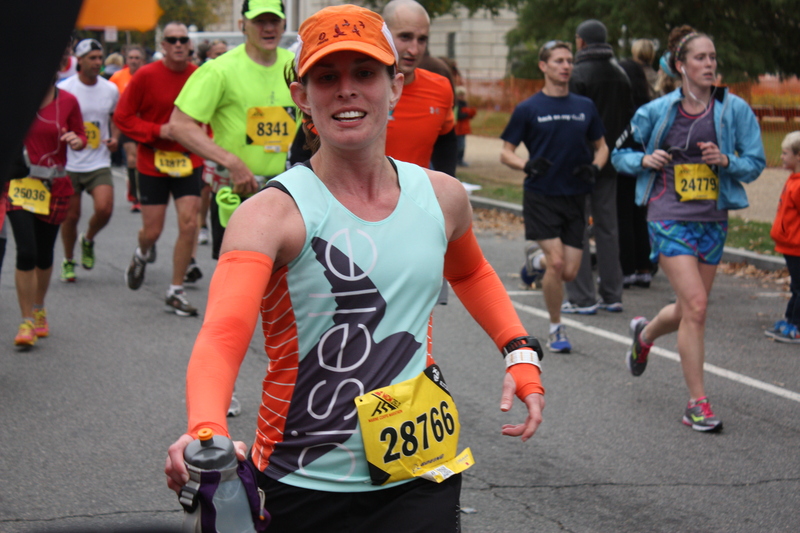 I had my usual pre-race meal, body-glided up and packed all my fuel into my Oiselle distance shorts. After adding some throwaway layers on top, we were out the door and Ian dropped me off as close as possible to the Rosslyn metro. I hopped right on a train and was quickly at the Pentagon stop. It was really crowded on the platform so I waited what seemed like forever (actually not that bad) to get up the escalator and exit the station. I was stuck right behind some guy throwing up into a bag though, which was a bit gross, but I kept reminding myself he had it much worse than I did. On my way out I ran into one of my Oiselle teammates. It was so awesome to meet Prianka and have someone to chat with and keep the nerves calm on our walk to the start area. My parents stayed at the Hyatt just around the corner from the finish, so I’d left a bag with them and skipped past the bag check area to grab a spot in the bathroom line. Soon after I was warming up while watching a group of paratroopers make their way down to the ground with a giant American flag…love this race. Then I made my way to the start. It was already very crowded, but I got a spot about 10 feet behind the 3:35 pacer. I ditched my extra layers and soon was on the move at the sound of the starting gun. The first mile was a lot of weaving until I finally just settled in as we turned up Lee Highway and made sure to keep the 3:35 pacer in my sights to stay on track. This was my first glimpse of my support crew – Mom, Dad and Ian – who were waiting with a sign to cheer me on and take pics. I ran by for a high five and headed up the hills. My pace felt easy and my calves which I’d had so much trouble with weren’t bothering me, however I could already feel my hamstrings tightening up at mile 2. I figured they would loosen up on the downhill and I’d be fine. The early hills passed pretty quickly and we turned onto Spout Run to make our way back down. I love how you can hear the roar of the crowd as you near the end of this small stretch and get ready to turn and cross the Key Bridge. Another high five from my support crew and I was smiling my way over the bridge. 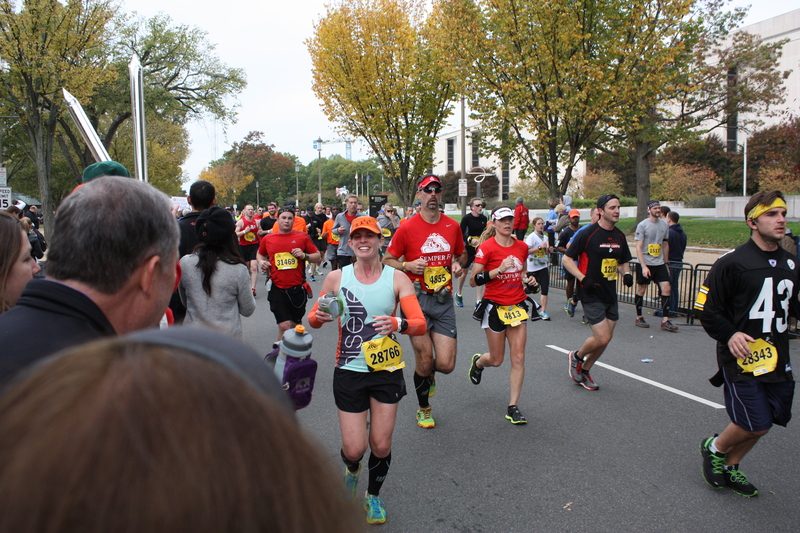 The crowds on M Street were fantastic, but I could feel the tightness in my hammies was still there and was spreading to my quads. By the time we turned down Wisconsin to make our way toward Rock Creek Parkway the 3: 35 pacer was already slipping away. How could this be happening so early I thought? I didn’t feel out of breath or at all winded, but I just couldn’t get my legs to go faster. Despite not having a great day, I still standby my earlier statements that getting rid of the Canal Road portion of the race and bringing Rock Creek Parkway back was a great addition. This part of the course is beautiful and way less hilly than the old route. By mile 7 the 3:45 pace group went gliding by me as if I were moving in slow motion. Ugh. Shortly after the turnaround on Rock Creek, I heard someone yell, “Go Oiselle!” This happened a handful of times throughout the day and really made a rough day so much better! Around mile 9 my right IT band and left ankle added themselves to the list of body parts that hurt. What is going on I kept thinking and it really hit me that today was going to be a much longer day than I had planned. Soon I was on my way into Hains Point. This part of the course gets a bad rap, but really wasn’t all that bad this year I thought. Thanks to the picture perfect race weather, the wind that can be beyond brutal here was barely there. Also, passing the line of signs here with pictures of marines and the date they were killed in action was a humbling and inspiring experience. The strategically placed cheer squads along this section of the course provided a great boost as well. It was also at this point that I met another Oiselle teammate. Brennan came running up to me and gave me a hug and some words of encouragement before passing by and continuing on to her first marathon finish!! This was enough to keep me going through the rest of Hains Point as the pain slowly started to get worse. Around mile 15 my hips started aching too and I started to wonder how I was going to make it to the finish line like this. Thankfully the crowd support was great here as I made my way back up toward the Washington Monument from the Lincoln Memorial. Have I mentioned I love this race and all it’s amazing sights? I also knew my support crew was waiting for me just past mile 17 and I couldn’t wait to see them again. As I ran up the Mall toward the Capitol Building I kept my eye out for the orange sign they were holding and let a big smile cross my face once I spotted them. 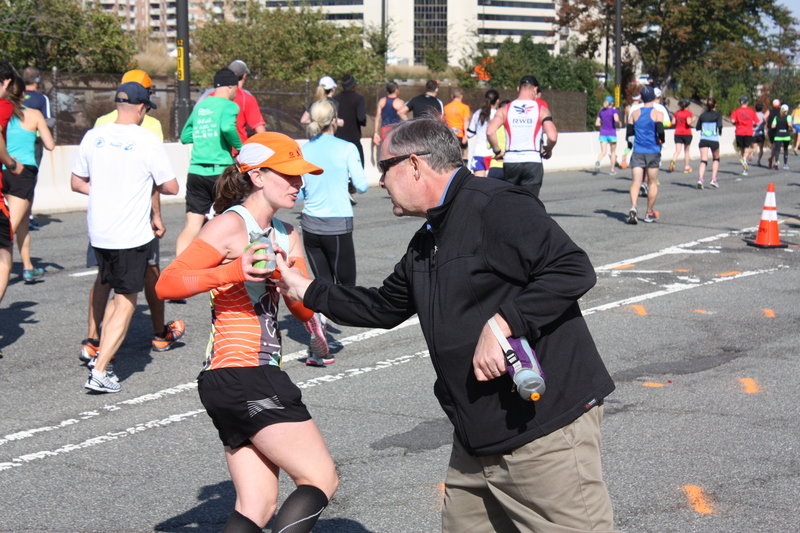 A quick handoff with my Dad and I had a new water bottle to replace my empty one. At this part of the course, I’m always so thankful when we hit the Capitol and turn in front of it rather than going up and around like many of my training runs. That hill is brutal! I quickly realized it was a bad idea to carry my smaller water bottle first, as having my 16-ouncer now felt like it weighed a TON. 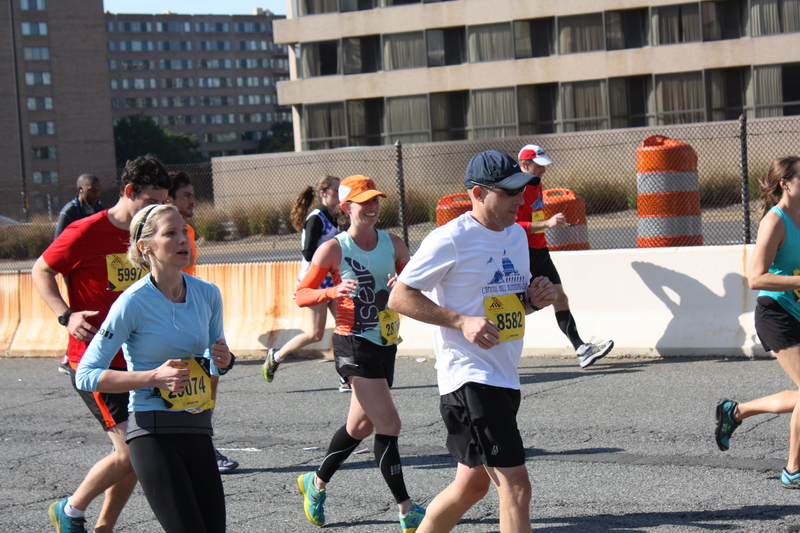 Luckily the fam had hurried across the Mall and saw me again at mile 19. I waved and dropped the bottle as I ran by. Thankfully without even saying anything they realized what was wrong and had the smaller one refilled for the next time I would see them. There was no doubt I was hurting, but I’d come to grips with the fact that my goal was not going to happen today and coming up on mile 20 the end started to feel within reach. I passed the mile marker and came up on the infamous 14th Street Bridge. In an instant everything nearly fell apart. The bottoms of my feet like most of my body hadn’t been feeling great today, but all of a sudden I felt a shot of pain up my left heel. Every time it hit the ground was excruciating. I hopped along trying not to curse too loudly as I grabbed the road divider for support and tried not to let my left heel touch the ground. This is why I love runners. I can’t even tell you how many people asked if I was OK, patted me on the back, told me I could do it and offered me waters, Gu and assistance. You all are remarkable as I’m sure no one was feeling super good at this point of the race, so thank you. Thankfully though, the pain started to dull after a quarter to a half mile of this that felt more like 20, and I was able to put weight on my foot again and resume my run to the finish. It was more of a shuffle by this point though as I could barely even lift my feet over cups strewn on the ground as I passed through water stops for the rest of the race. Finally, I would “Beat the Bridge” and make my way into Crystal City. This is another area with great crowd support pushing you closer to the finish. It was around this point that my ego would take a bit of a hit. I was passed and eventually beaten by a a Dunkin Donuts cup, the Chick Fil A cows and a dragon. Awesome. As Crystal City was coming to an end I kept my hopes up that I would see my support crew one more time. Depending on how the metro worked out, they were going to try to catch me at about 23.5. Again I spotted that orange sign my Mom was holding high and couldn’t be happier. Ian was still snapping away with the camera and my Dad held up my smaller water bottle. I ran over to grab it, yelled that I loved them and continued on my way so incredibly thankful for such amazingly supportive people in my life. I worked my way back by the Pentagon where crowd support waned, but Marines loudly cheered us on and told myself to just keep putting one foot in front of the other for the last two miles. I have never wanted a marathon to be over so badly in my life. I ran back through the start line and heard people yelling less than a mile and a half to go. Oh. Thank. God. I could hear the crowd before I could see them as I made my way toward the final stretch. Despite the cruel, cruel hill up to the finish line, I have always loved the finish experience of this race. With Arlington Cemetery just to your left and thousands of people cheering wildly, you feel like a rock star as you climb the last hill and turn towards the finish line just before the Iwo Jima Memorial. I put my head down and summoned every last bit of energy I had to push up that hill and run to that finish line. I crossed the line and felt relieved. My finish time was 4:12:41. If I’m being honest I didn’t smile when it was over or get my picture taken in front of Iwo Jima like after my last two MCM’s. I just took my medal, thanked the Marines and was happy it was over – but I wasn’t really happy at all. I fought back tears and plodded my way through the finisher’s area trying to thank as many of the Marines as possible. It seemed like an endless walk to the entrance of my old apartment where I knew my support crew was waiting. Once I saw them I finally smiled and gladly accepted their hugs despite how gross I must have been at that point. Now I was done. A disappointment to walk hobble away missing my goal by so much for sure, but I’m so very glad I didn’t give up. 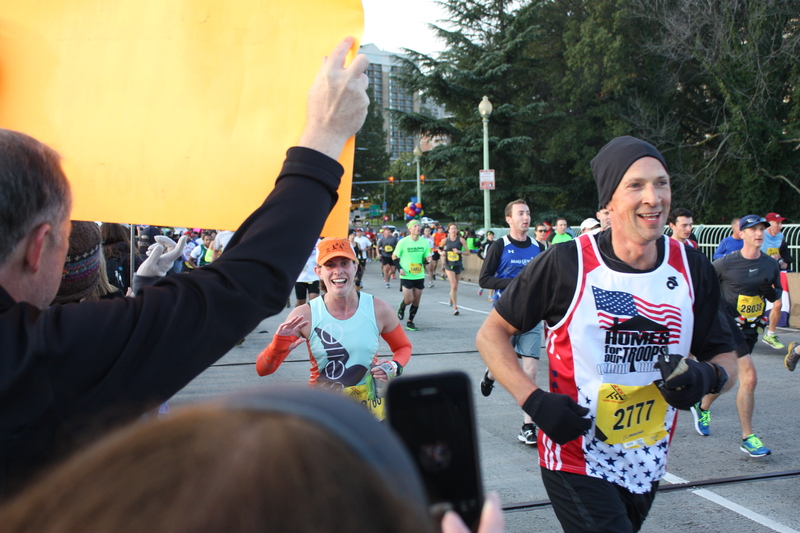 Ten marathons is certainly something to smile about. If you made it all the way to the end of this ridiculously long post, thanks for reading through all of my rambling thoughts. How did your weekend racing go? How do you bounce back after falling short on a goal race? 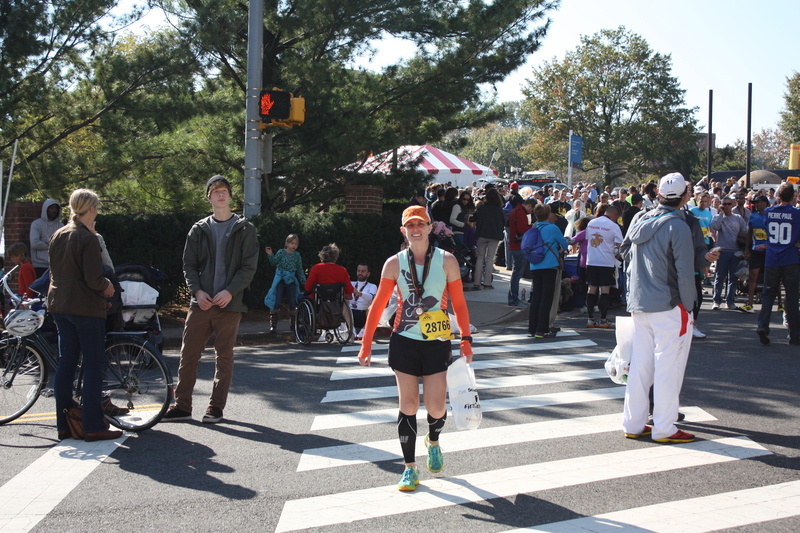 This entry was posted in D.C., Fitness, Marathons, Races, Running and tagged 26.2, crowd support, marathons, Marine Corps Marathon, pain, running by Colleen Lerro. Bookmark the permalink. 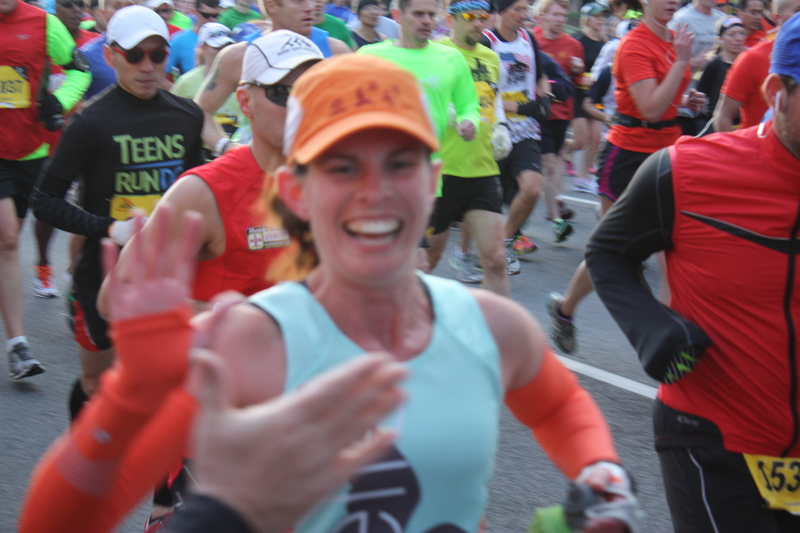 That goal is in your grasp, you HAVE the BQ! Hi! new to your blog from Brennan’s blog but love this recap. I can feel the disappointment just by reading it but love that your family was there to support you and that you looked so happy in every photo. You did the race given bad circumstances and pushed through and got that medal so you should be proud of yourself. It wasn’t a BQ but it wasn’t a bust! You are awesome!! Thanks so much! I’m starting to shake it off now that a few days have passed and am already planning my next racing adventures – although I may take a break from marathons for a bit! Loved reading this, Coll! I literally had tears in my eyes reading how you pushed through the pain. And you had an amazing support system! Aww, Thanks! And yes, they were awesome! Thank you! Can’t wait to hear about your Richmond experience …you’re going to love it and do great!! Aw, sorry to hear you were disappointed BUT you did an amazing job pushing through pain and for that you should be proud!! Thank you! I’m definitely feeling better about it as I get further away from it and can have a little more perspective. Also, just checked out your blog and added it to my favorites… love it! Good luck w/ training for your first full next year. I’m hoping to do the half at Shamrock!! aw, thanks!! I’m excited for Shamrock 🙂 Glad i found your blog too! CONGRATULATIONS! I know how it can feel to be so disappointed but just think how mentally stronger you are because of what you battled through. 🙂 Good luck with training and your next race! Thank you! I’m already starting to plan out my next races, so it’ll be good to have something new to focus on.